The best solar panel only converts about 20 percent of the sun’s rays hitting its surface into usable electricity. On a perfect day at sea level, that panel could generate approximately 200 watts of electricity per square meter. Introduce clouds, shade from trees, or dust in the wind and that power drops even further – making solar a variable energy source for the grid, or anything else powered by photovoltaic panels. 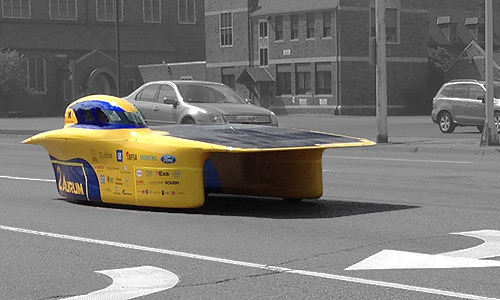 So, our physical analytics team at IBM Research built a basketball-sized and shaped camera that can predict solar radiation for the Department of Energy – and more recently, the University of Michigan’s solar car team. The wide-angle (more than 180 degrees) sky camera provides information on sky conditions and their rate of change. Where is the sun? How many clouds are in the sky (and with some triangulation with other cameras, how high are they)? 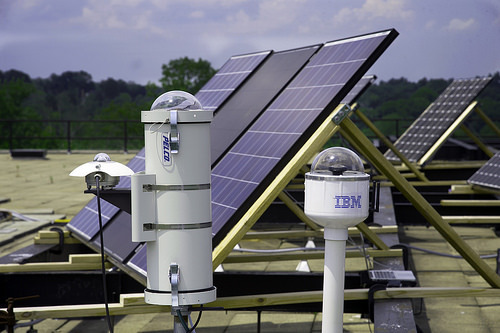 The sky camera is also built with a solar pyranometer, GPS sensor and onboard processor, all packaged in a weatherproof enclosure for external use. The pyranometer provides an instantaneous and precise readout of solar radiation. The GPS sensor give precise location information. All of this information is processed using an onboard computer and a predictive model to generate real time solar insolation (sun exposure) values and prediction for 10-15 minutes in the future. These results are transmitted by direct network connection, or satellite link in the case of the mobile unit. The sky camera data is sent to a cognitive computer that couples this real time information with incoming weather data, such as wind speed and direction, as well as historical forecasts. The machine learning algorithms that interpret this information give us an improved picture of how much solar energy our panels are absorbing now, and how soon-to-happen weather events will affect the panels’ ability to absorb the sun’s rays. Utility grids are stationary. Put the camera in a place with an unobstructed view of the sky, and let the data roll in. So, when the University of Michigan’s solar car team asked us about using the cameras to help with forecasts for their upcoming World Solar Challenge race in Australia, we had to not only think about all the variables of it continuously seeing and understanding a new slice of sky as it cruised down the road, but also how we were going to make it mobile at all. The solar car is a four-wheeled solar panel that can maintain speeds well above 60 miles per hour. And we would need to know at any moment the car’s solar absorption per square meter of its panel. A rental car’s roof luggage rack is not a good fit! Thankfully, after a 600 mile mock race with the UM students, the mounting system is stable and ready for the Australian outback on October 18. Our camera will be perched on top of UM’s weather car, which drives about 10 to 15 minutes ahead of their solar car. This allows the camera to absorb data from the approaching sky, and our system to produce a short term forecast, for the UM team. If clouds are moving toward the route, they can determine if the solar car should change its speed based on the clouds’ speed – saving valuable time and energy. The system will also use the camera’s data and historical forecast data to produce a long range forecast. This prediction gives UM a benchmark to help decide where to park the solar car during the week-long race. Where and when the team stops will make an important difference in how efficiently they can recharge the car’s battery via the solar panels before nightfall. Only three hours separated first and second place at the 2013 World Solar Challenge. We hope our camera and system help UM save as many precious minutes as possible. We also hope that this race will demonstrate cognitive computing in solar forecasting. Large solar facilities, like ISO-New England, can quickly shift Gigawatts of power to other sources when a thunderstorm rolls in, and know when to switch back without any downtime, or worse, outages. 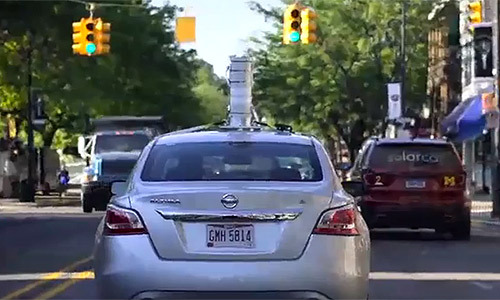 Editor’s note: this article was contributed by Senior Technical Staff Member Theodore Van Kessel, Research Staff Member Xiaoyan Shao, and Research Staff Member Siyuan Lu of IBM Research’s Physical Analytics team.